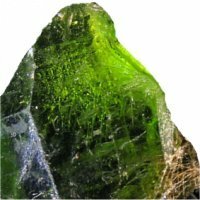 Olivine is a magnesium iron silicate. It takes its name from its colour which is typically olive-green due to traces of nickel in the rock. Although Olivine is the generic name, this mineral also has a number of other names, for example Chrysolite from the Greek meaning 'Golden Stone', or Peridot (which is what the French call Olivine). In general usage Peridot refers speciffically to those speciments of Olivine which are gem quality. Some of the finest Peridots have been obtained from the mantle rocks of Zabargad island in the Red Sea. To make matters of nomenclature even more complicated, Olivine really describes a series of minerals ranging from Fayalite (Fe-endmember) to Forsterite (Mg-endmember). Fayalite has a formula of Fe2SiO4 whereas Forsterite is a pure magnesium silicate. However, the two end members are relatively rare and most of the minerals in this series contain both iron and magnensium in different amounts. Compositions of Olivine are commonly expressed as molar percentages of forsterite (Fo) and fayalite (Fa) (e.g., Fo70Fa30). Olivine is not a stable mineral and readily changes its structure as a result of weathering and hydrothermal action. Serpentine is a common result of these changes. Olivine also gives its name to the group of minerals with a related structure (the olivine group). This group includes tephroite (Manganese silicate) monticellite (calcium magnesium silicate), and kirschsteinite (calcium iron silicate). Olivine is a rock-forming mineral which occurs in mafic (where the minerals are usually dark in colour and have a specific gravity greater than 3) and ultramafic (silica-poor) igneous rocks such as basalt, gabbro, troctolite and peridotite. Dunite, for example, is a rock composed exclusively of Olivine. Olivine, or high pressure structural variants of the mineral, constitute over 50% of the Earth's upper mantle, making it one of the Earth's most common minerals by volume. But Olivine is not only common on Earth. Studies of the Martian spectra carried out by Todd Hoefen and Roger Clark at the U. S. Geological Survey in Denver have shown that Olivine can also be found on Mars. This was confirmed by NASA Goddard Space Flight Centre which reported a 30,000-square-kilometre area of Olivine-bearing rock in the Nili Fossae region, north-east of Syrtis Major. Olivine has also been reported in samples collected from the Moon and the Wild2 comet. (A NASA spacecraft named Stardust collected the particle samples from the tail of 81P/Wild comet in 2004.) Analysis of these extra-terrestial samples showed a substantial amount of crystalline silicates such as Olivine, Anorthite and Diopside in the material. Mg-rich Olivine has also been discovered in a number of meteorites, in particular pallasite - a stony-iron meteorite which contains crystals of Olivine suspended in the nickel-iron matrix. A good example of such meteorite is the Glorieta Mountain meteorite. An interesting idea which is now being tested, is to use of Olivine to sequester CO2 from the atmosphere. Olivine reacts easily with the CO2 in air. So for example, all the CO2 produced by burning a litre of oil can be absorbed by less than 1 L of Olivine. The end-products of the reaction are silicon dioxide, magnesium carbonate and small amounts of iron oxide. Furthermore the process is exothermic which means that as a side effect heat is produced which can be used to generate electricity. The Hawaiian Islands are rich in Olivine. In Maui, the Valley Isle (the second most visited of the Hawaiian Islands) visitors can bathe in the Olivine Pools. These pools were named after the encrustations of this semi-precious gem in the surrounding lava and sandstone. The Olivine Pools are naturally-formed swimming pools located on a lava shelf which stretches along the coastline. When the sea is calm, the area is excellent for both swimming and sunbathing.